XINING -- Chinese scientists said Wednesday glaciers that serve as water sources on the Qinghai-Tibet plateau are melting at a "worrisome speed," having receded 196 square km over the past nearly 40 years. The decline is equal to about one-fourth of the size of New York City. Xin Yuanhong, senior engineer in charge of a three-year field study of glaciers in the region, said glaciers at the headwaters of the Yangtze, China's longest river, cover 1,051 square km, down from 1,247 square km in 1971. "The reduction means more than 989 million cubic meters of water melted away," said Xin, whose team surveyed the glaciers between June 2005 and August 2008. That much water would fill Beijing's largest reservoir. The team was composed of experts from the Qinghai Provincial Geological Research Institute and the Beijing-based China University of Geosciences. Xin said the team has just finished its report. The data will be used by the China Geological Survey Institute under the Ministry of Land and Resources to draft water-preservation policies. 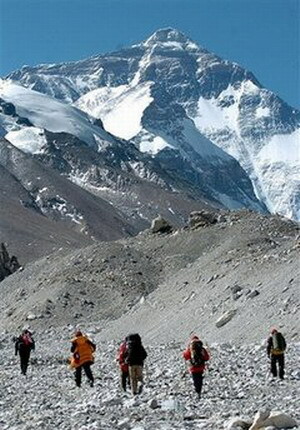 The team found the glacier tongue of Yuzhu Peak of Kunlun Mountain fell by 1,500 meters over the past nearly 40 years. The retreat rate is close to that of the Quelccaya Glacier in Peru, the world's largest tropical ice mass. The eastern side of the glaciers in the Tanggula Mountain Pass saw the fastest melt rate, with the front receding 265 m annually. The average annual retreat speed was 7.57 m when compared with the figures for 1970. Xin attributed the accelerated melting to global warming. "Melting glacier water will replenish rivers in the short run, but as the resource diminishes, drought will dominate the river reaches in the long term," he said. He explained that the uplift of the plateau has blocked warm, humid air over the Indian Ocean from flowing over the towering Himalayas and Tanggula Mountain to the Yangtze River reaches. Warmer weather in the area is attracting more cattle and sheep herders, adding pressure on the ecosystem, said Li Lin, the head of Conservation Strategies at the World Wide Fund for Nature China.